Organizations competing in today's rapidly changing technological markets are faced with the challenges of "dualism"--operating efficiently in the present while innovating effectively for the future. Managers and leaders within these organizations not only have to focus on current market success and profitability, but they must also introduce the next generation of technical advances, product attributes, or service features that will sustain and even augment their continuing global competitiveness. 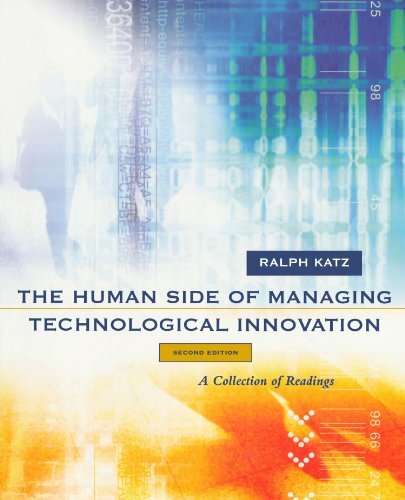 The Human Side of Managing Technological Innovation, 2/e, provides a variety of approaches and perspectives on issues critical to the effective leadership of technical professionals and cross-functional teams throughout the innovation process. Designed for courses within business, engineering, and executive education programs, the book has been updated throughout and features more than twenty articles new to this edition. In the articles, researchers and practitioners present their thoughts and ideas of the complex interplay between the specialized knowledge and skills of creative professionals and the realistic pressures and constraints required by successful business organizations. The text is organized into seven sections that cover such topics as motivating professionals, measuring productivity, organizing and leading cross-functional development teams, enhancing creativity and decision-making, developing human resource capabilities, building and maintaining innovative climates, managing lead users for new product innovation, and using technology as a strategic resource. It can be used in advanced undergraduate or graduate courses as well as in organizational workshops and seminars that focus primarily on how managers, individual professionals, project teams, and functional groups deal with problems and issues related to the management of technology-based innovation. The book can also be used as a complementary text for any course that emphasizes product, process, organizational, or technological innovation. The Human Side of Managing Technological Innovation, 2/e, provides a unique collection of articles that increase the sensitivity and understanding of individuals who are managing or influencing innovation and change processes within organizations. It also offers practicing managers and staff professionals new ideas, tools, and insights for problem-solving, organizing, and functioning more effectively.